Mission statement: To bring about awareness of the quality of indoor and outdoor lifestyle through universal design, green building, safety, and healthy home construction practices to the public, construction and design industries. Universal design is a framework for the design of living and working spaces and products benefiting the widest possible range of people in the widest range of situations without special or separate design. Universal design is human-centered design, accommodating people of all sizes, ages, and abilities. Besides showcasing universal design principles, the goal is to have the home certified from the U. S. Green Building Council Leadership in Energy & Environmental Design (LEED) for Homes, the National Association of Home Builders National Green Building Program, and Energy Star. This national demonstration home and Universal Design Living Laboratory will serve to help people better understand how to create a more comfortable living environment that will enhance their quality of life. 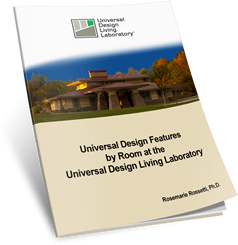 This Universal Design Living Laboratory will serve as a resource for others to learn from – today and tomorrow. An approximately 3,500 square foot ranch-style home, presently in the final phase of design, is to be built on Clark State Rd. in Jefferson Township in the Columbus, Ohio Metropolitan Area. Construction is anticipated to begin in the spring of 2009 and end in the spring of 2010. The future residents, Rosemarie Rossetti, Ph.D., a wheelchair user, and her husband, Mark Leder, have embarked on an ambitious campaign to build a home and create the Universal Design Living Laboratory that will be open to the builder, designer, architect, and consumer publics. The home incorporates unobtrusive universal design, resource and energy efficient green building methods, advanced automation technology, a healthy home construction approach, and the design principles of feng shui. The finest craftsmanship and state-of-the-art products and services will be incorporated. The gardens will be wheelchair accessible with pathways and will feature raised beds and containers. Spanning more than seven years of planning, the owners have assembled the finest design, construction and consulting talent to complement their expertise. The primary and most unique design challenge for the residents is height. Rosemarie is 4’2” tall when seated, while Mark stands at 6’4”. Both manage separate home-based businesses which necessitate private offices. They desire an easy-to-maintain residence and fully accessible landscaped environment that provides ample space for entertaining and housing extended-stay family or guests. Further, as a horticulturist, Rosemarie would like to resume her gardening hobby, which was suspended because of her spinal cord injury in 1998, when she was crushed by a 3 ½ ton tree while riding her bicycle. Rosemarie’s life-changing injury has led her to become a strong advocate for accessibility, adaptability, and empowerment for all people. She comes uniquely qualified to actively promote universal design housing and accessible gardening. Life experiences as a wheelchair user for the past ten years. She identifies with the problems of mobility and independence. 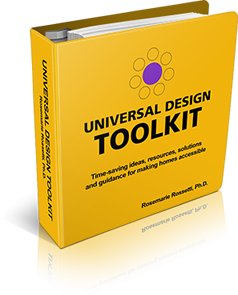 She recognizes the intrinsic solutions that universal design offers. Expresses her convictions from the point of view of a consumer. Professional speaker, trainer, writer, publisher and consultant. Presenting speeches internationally to audiences from ten to several thousand. Experienced educator with a Ph.D. in Agricultural Education from The Ohio State University (OSU). Taught courses at OSU in teaching methods, oral expression, and marketing for 11 years. Undergraduate horticulture major from OSU. Horticulture instructor for three years; Certified Interior Horticulturist; writer for national gardening publications; eight years as an interior landscaper. Author of a monthly syndicated column with a circulation exceeding 53,000. Writer of more than 100 published essays and articles. Author and publisher of books: Take Back Your Life! and The Healthy Indoor Plant. Selected as Ms. Wheelchair Ohio 2004 and Discovery through Design “Roll Model” 2005. Comprehensive sales and marketing background. Experienced in creating comprehensive continuing press and media exposure. Enthusiastic, warm, and empathetic personality draws listeners to her message. Mark Leder brings his outstanding consultation and project management expertise to this campaign. Having more than 11 years experience in commercial property development, Mark currently operates a national business concern as a web site programmer and designer with special emphasis in Internet marketing. National television programs have been contacted in order to document the design and construction process (PBS, HGTV, HGTV Pro, Discovery Channel). WOSU, a PBS (Public Broadcasting Service) station in Columbus, Ohio, has confirmed its interest in partnering with an independent producer to create, broadcast, and distribute a one hour documentary about the development, creation and construction of the nation’s first Universal Design Living Laboratory. National distribution of this program will be pursued through either PBS or the National Educational Communications Association (NETA), a professional association that provides services to PBS stations in all 50 states. While a national release of this program cannot be guaranteed, some WOSU productions have been nationally distributed. WOSU believes universal design is a timely and relevant topic that will be of interest to a national audience. The National Association of Home Builders (NAHB) is the world’s largest construction federation with more than 220,000 builder-related member companies. National magazines such as the NAHB’s 50+ Housing Magazine and Builder Magazine are being targeted for articles. Popular consumer magazines and newspapers (Wall Street Journal, Better Homes & Gardens, Builder/Architect, In Home, From House to Home) have agreed to publish future articles. Articles have been written about the project by Rossetti for NAHB’s Nation’s Building News (April 2005), Columbus Monthly Magazine (March 2005), New Mobility Magazine (July 2005), Woman (December 2005), National Spinal Cord Injury Association (March/April 2006), United Spinal Association’s Action Magazine (March 2006) and (June 2006), SpeciaLiving Magazine (June 2006), NAHB’s 50+ Housing Magazine (June 2006), Ultimate Home Design Magazine (July/August 2006). Articles have been written about the project on the web sites for HGTV Pro and Startup Journal (Wall Street Journal). Press releases have been distributed internationally to selected electronic and print media. The web site for the project, www.UDLL.com continues to be developed by Mark Leder. Currently, the web site includes a project summary and universal design articles written by Rosemarie Rossetti, Ph.D. Also included are bios and links to the design, construction and consulting team members’ web sites. The web site will feature a virtual tour of the home and list all products and vendors who are partners in the project. Photos will be taken throughout the construction process and will be displayed. Links will be provided to the partnering company’s web sites. Strategic alliance partners will also be listed with a link to their web sites. A resource section will also be developed. will be made available for builders, home remodeling contractors, architects, interior designers...and Realtors, including these groups: National Association of Home Builders (NAHB), American Institute of Architects (AIA), American Society of Interior Designers (ASID), International Interior Designers Association (IIDA), National Kitchen and Bath Association (NKBA), Building Owners and Managers Association (BOMA), International Facility Managers Association (IFMA), Building Industry Association (BIA), National Association of Realtors (NAR), National Association of the Remodeling Industry (NARI), and others. Tickets will be available once the UDLL is complete so individuals and groups can tour the home. Net proceeds from ticket sales will benefit spinal cord injury research at The Ohio State University. For more information about the Rosemarie Rossetti Spinal Cord Injury Research fund, click here. Organizations that serve people with disabilities and the aging population will also be invited to tour the home (Spinal Cord Injury Support Groups, Mid-Ohio Board for an Independent Living Environment, Ohio Physical Therapy Association, Ohio Occupational Therapy Association, Central Ohio Area Agencies on Aging, and others). The horticultural community will also be invited to the home to learn about universal design and view the landscape (American Nursery & Landscape Association (ALCA), American Society of Landscape Architects (ASLA), Landscape Design Association (LDA), Association of Professional Landscape Designers (APLD), National Gardening Association (NGA), Perennial Plant Association (PPA), Central Ohio Water Gardening Association, American Landscape Contractors of America (ALCA), Columbus Landscape Association...). Tour guides will include interior designers, horticulturists and Realtors. Presently, educational outreach and participatory involvement has been extended and agreed to by universities and community colleges (The Ohio State University, North Carolina State University Center for Universal Design, Rensselaer Polytechnic Institute, and Columbus State Community College). Additional educational audiences will be introduced to this Universal Design Living Laboratory. Organizations and associations that offer seminars, conferences, workshops and continuing education credit have also been contacted (NAHB, AIA, ASID, ALCA, NAR, Adaptive Environments, and Universal Design Alliance). Speaking engagements are being pursued to promote the project. Rosemarie Rossetti spoke for the U.S. Department of Justice, Civil Rights Division - Multi-Family Housing Access Forum in Chantilly, VA in May 2005. Rossetti spoke at the NAHB International Builders’ Show in January 2006 and at the NAHB 50+ Housing Symposium in April 2006. She spoke at the Rensselaer Polytechnic Institute in Troy, NY in January 2006. She also spoke at The Ohio State University at an ADA conference in April 2006, and at an international conference on universal design in Columbus in July 2006. Rosemarie presented a keynote at the New York School of Interior Design in New York City, and at the Custom Electronic Design and Installation Association (CEDIA) - Electronic Lifestyles Forum - Las Vegas, NV in April 2007. She was the keynote at the national convention of the American Society of Interior Designers in March 2008 in New Orleans. Additional associations and organizations continue to be contacted for future speaking opportunities. A fully documented Menu of Contributor Opportunities is available.